Max’s dream is to live in Paris and be a poet. But do you think it is easy for a dog to pack a small brown suitcase, put on a beret, and hop on a plane? Ha! No one will buy Max’s poems, so without money he must stay put. But living in New York City isn’t so bad. Where else could he have friends like Bruno, with his invisible paintings, or Marcello, who builds upside down houses? And where else could he drop in at Baby Henry’s Candy Shop? It’s all possible in New York, a jumping jazzy city. And for Max, it’s a dog’s life that only Maira Kalman could invent. Maira Kalman is an illustrator, author, and designer. She has created many covers for The New Yorker, including the famous map of Newyorkistan (with Rick Meyerowitz). 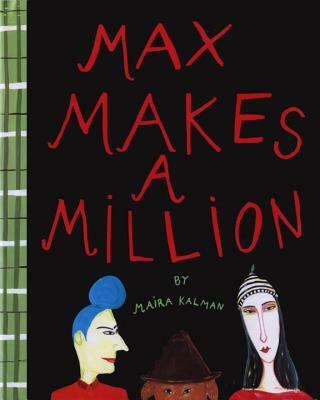 Kalman is the author of twelve children’s books, including five books about Max the dog, which will be reissued by The New York Review Children's Collection: Hey Willy, See the Pyramids and Max Makes a Million (September 2017); Ooh-la-la (Max in Love) and Max in Hollywood, Baby (February 2018); and Swami on Rye (September 2018). She also has designed fabric for Isaac Mizrahi, accessories for Kate Spade, sets for the Mark Morris Dance Company, and, with her late husband, Tibor Kalman, under the M&Co. label, clocks, umbrellas, and other accessories for the Museum of Modern Art. Her work is shown at the Julie Saul Gallery in Manhattan.